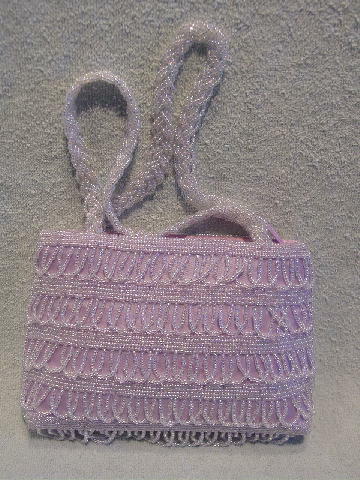 This never-used light purple fabric evening purse has five horizontal rows of iridescent tiny beads. Hanging from the rows are dangling loops of the iridescent beads. There is a top side to side zipper opening with a shiny light purple lining and interior pocket. There are two 11 1/2" long by 3/8" wide braided iridescent beaded handles. It's a very feminine little bag. A Miami model got it as a birthday present from her now-ex boyfriend. She sold it because it reminded her of him.